Apple cider vinegar(ACV) changed my life for the better, It’s one of the greatest natural creations that I’ve ever encountered. It’s helped me with detoxification, improve my digestion and was a sniper for my candida overgrowth. But I’ve also used apple cider vinegar for thinning hair, whitening my teeth and as a general household cleaner. In the naturopathic world apple cider vinegar is known to panacea for many ailments such as acid reflux, arthritis, high blood pressure, and body acidosis. ACV’s miraculous healing power comes from its compounds such as acetic acid, magnesium, potassium, prebiotics and enzymes. Acetic acid illuminates dangerous bacteria, while at the same time nurtures the growth of beneficial bacteria, it basically acts as a natural antibiotic minus all of the dangers of traditional antibiotics. ACV is loaded polyphenols which are responsible for the prevention of cardiovascular disease, neurodegenerative diseases, cancers, Alzheimer’s, osteoporosis and diabetes. Apple cider vinegar is a liver and lymphatic tonic which helps to detox the body. It also stimulates cardiovascular, bowel movement and lymphatic drainage. Mix the apple cider vinegar with water and use as a mouth wash. The PH of apple cider vinegar can remove stains from your teeth, but do not use without water dilution or it will break down tooth enamel. Drinking 1 tbsp of apple cider vinegar with water can help to rid the body of acid reflux. ACV contains prebiotics and a type of acid that promotes the growth of probiotics which help kill candida. Apple cider vinegar contains acetic acid which although acidic has an alkaline effect on your body. Removing acids from your body while balancing your bodies pH can reduce your risk of illnesses and increase your energy. Medical research states that the acetic acid found in apple cider vinegar can balance blood sugar and improve diabetes. Mix a 50/50 solution of apple cider vinegar together and soak your pet in a tub. Do this daily for several weeks to rid your pet of fleas. Another amazing treatment of ACV is for allergies. 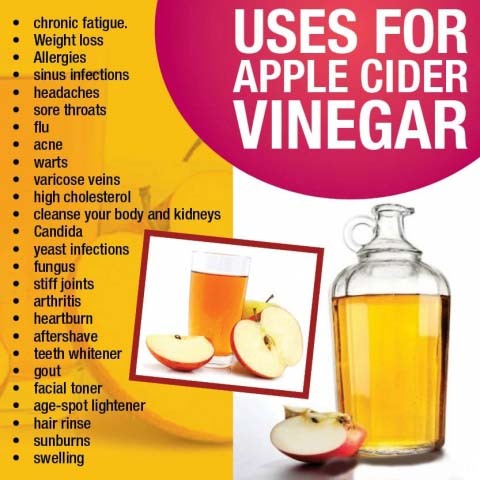 ACV helps break up mucous in your body while supporting the immune system and clearing your sinuses. The anti-bacterial and anti-fungal compounds in apple cider vinegar make it a great natural cure for skin and toenail fungus. Simply rub on the area of fungus a couple of times daily. The pH of apple cider vinegar makes it an excellent remedy for skin issues, just dab some on the skin. Apple cider vinegar improves circulation in the vein walls and is anti-inflammatory which helps to reduce oversized veins. Bad bacteria and yeast are the cause of body odor. Being the armpit is damp it makes for a perfect breeding ground for bacteria. Dip some apple cider vinegar on a cotton ball and dab it into your armpit to kill bacteria which will neutralize odors, keeping you odor free. Gargle with apple cider vinegar and water to cure a sore throat! Drink two tablespoons of apple cider vinegar in a glass of water three times a day to cure a cold. Apply some apple cider vinegar topically on the wart and then cover it with a band-aid or bandage. Leave it on overnight and remove the following morning. You should see results within a few days or it could take longer. How did Apple cider vinegar change my health? After going through a barrage of antibiotics in one calendar year, my health started to deteriorate and the weight started to pile on. I developed an unnerving sugar craving and with time I forgot I even had a sugar craving, I unknowingly accepted it as my craving. One day I drank a soda and immediately I felt bloated and I mentioned it to a friend and she said I probably had candida overgrowth. I had no idea what candida was so I googled it. After googling it I read many articles with Apple cider vinegar linked to its removal in many of the articles, I knew of Apple cider vinegar but I had no idea of its health implications. So according to what I had read they recommended I start taking 3 teaspoons a day, but I chose to take 3 tablespoons a day instead. Within minutes of taking my first dosage of ACV, my bloated stomach gained relief. After a few weeks of taking ACV, I noticed some incredible changes in my body. My candida overgrowth subsided in my stomach, but not the intestines. I no longer needed to wear deodorant, my body was so alkaline bacteria couldn’t exist on my skin. I had no body odor at all. So where and what kind of Apple cider vinegar should I buy? Only but organic, unfiltered and unpasteurized apple cider vinegar with “mother”. Anything else will not reap the aforementioned benefits. The murky brown appearance of apple cider vinegar, as well as the strands of benevolent bacteria, is known as “Mother”. I advise to only buy Braggs Apple Cider Vinegar with “mother” which can be found at many grocery stores and health stores. Not all Probiotics are the same, but the right ones can change your life!